t*rexes and tiaras: stand in the water, drown next to me..
A rainy weekend for camping, but never mind. Day 13 of Selina's challenge calls for a lazy day outfit, so here's one from last weekend, worn to wander into town with a list of errands to run, which I managed before getting completely waylaid in the fabric shop. I'm glad the sewing bug seems to have caught me again recently; I'm trying to make the most of this spurt of enthusiasm for it. 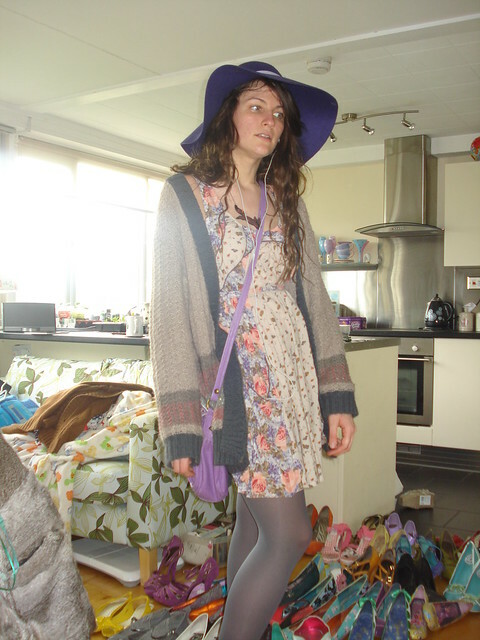 The dress is one I haven't worn for a long while really until recently, due to it's insanely short nature. I bought both dress and cardigan in the Miss Selfridge sale after waiting ages for them to finally be reduced - am I the only person who will go and check on this? - and I was inspired after posting about it recently to add the hat. I wore it, but I don't think I'm ever going to be one of those people who can wear a hat well. I kept having to put a hand to it as I was worried it would blow away, and had visions of it landing in the river on my way home. I love the print on the dress! I can get lost for hours in my local fabric shop, it's like a maze haha. I need to get back into sewing and crafting, I haven't done any for ages! You have the legs for a short dress! I always mean to ask- does that flock of shoes (hmmm, what's the collective noun for shoes?) always live in the middle of the floor? Do you ever trip over them? I'm hopeless, I trip over any obstructions!! The hat looks nice but I do know the feeling of insecurity, thinking it's going to blow away! uUsually it just ends up on the ground really close by- they're too heavy to fly really far!! 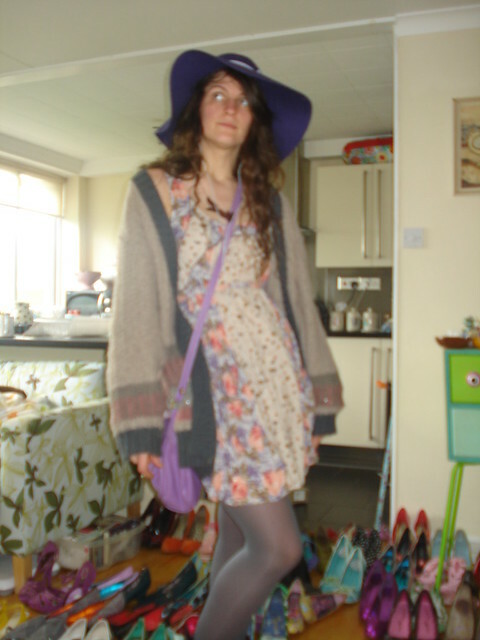 love the dress/cardi combo. I've not mastered that at all yet. The dress doesn't look too short on you from my perspective, I guess you usually wear slightly longer dresses so aren't used to it. 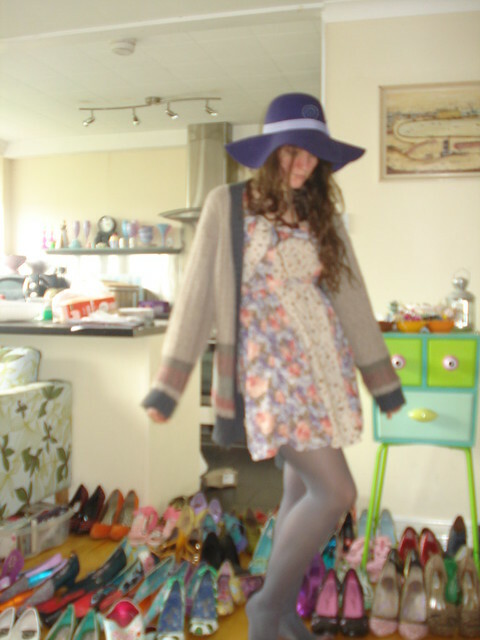 Love the tights, I've been really into grey tights for spring! More cheerful than black! I love this hat! The only hats I really wear are newsboys -- sometimes a fedora.